The Ring-necked or Rose-ringed Parakeet (Psittacula krameri) is a mainly green parrot with a red bill and a long, tapered tail. This is the Old World's most widely distributed parrot, occurring in northern Africa north of the moist forest zone as well as across much of southern Asia. In Africa, it is found from westernmost Africa east through Mali, southern Niger, northern Ivory Coast, northern Ghana, Burkina Faso, Togo, Benin, northern Nigeria and Cameroon, southern Chad, northern Central African Republic, southern Sudan, northern Uganda, Ethiopia, Djibouti, and northwestern Somalia. In southern Asia, it is found from western Pakistan and southern Nepal through India, Sri Lanka, and Bangladesh to southern Burma. In addition, introduced populations are widely established, including in the United States, England, Germany, the Netherlands, northern Egypt, Kenya, coastal Ivory Coast (possibly a relict wild population), South Africa, Mauritius (where it coexists with the related native but critically endangered Mauritius Parrot, Psittacula echo), the Arabian Peninsula, Singapore, Macao, and China in and around Hong Kong. It is frequent to abundant in Africa and most of Asia (fairly common in Burma). Abundance has increased during the 20th century with expanding agriculture and the species is widely bred in captivity. It is distinguished from all other Psittacula species by the combination of a green or bluish-green head, pale green body, absence of maroon shoulder patches, and (in adult males) black and pink collar markings. 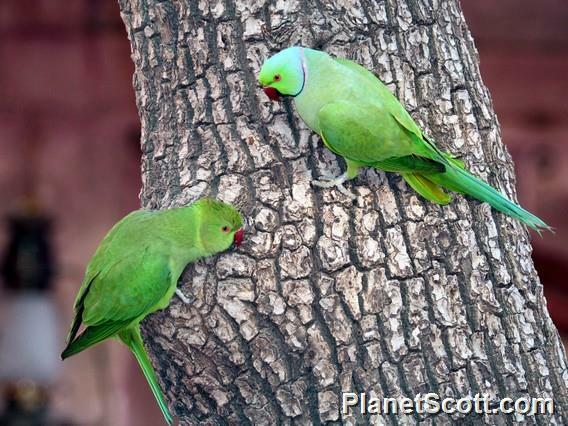 Ring-necked Parakeets are very noisy, especially at communal roosts. Ring-necked Parakeets are found in a range of woodland types from light secondary moist forest, riparian woodland, and mangroves through savanna grassland, open farmland with scattered trees, and parks and gardens in urban areas. They range as high as 1600 m in Asia and 2000 m in Africa. These parrots are highly gregarious, especially outside the breeding season, sometimes forming flocks of several thousand birds. They roost communally, often with crows, mynas, or other parrots. They nest in natural tree cavities, enlarged holes made by other species, in rock crevices, and on buildings. In Africa, the nest is always high in a tree. Typical clutch size is 3 to 4 eggs, but may range up to 6. Not 100% sure on ID.